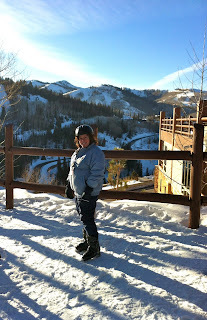 Our trip to Park City, Utah, last week was one of the best family trips we've ever taken. It's also a particularly great place to visit if you have a child with special needs. All of us skied, played, and ate ourselves silly. Which is to say, we are all very happy plump people. The scenery is gorgeous; one local I met says that every day, on her drive to work past the mountain range, she reminds herself to take a look. The air is so clean, my lungs were confused. 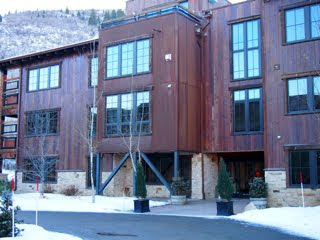 We stayed at The Silver Baron Lodge in Deer Valley, part of Deer Valley Resort along with the Lodges at Deer Valley. 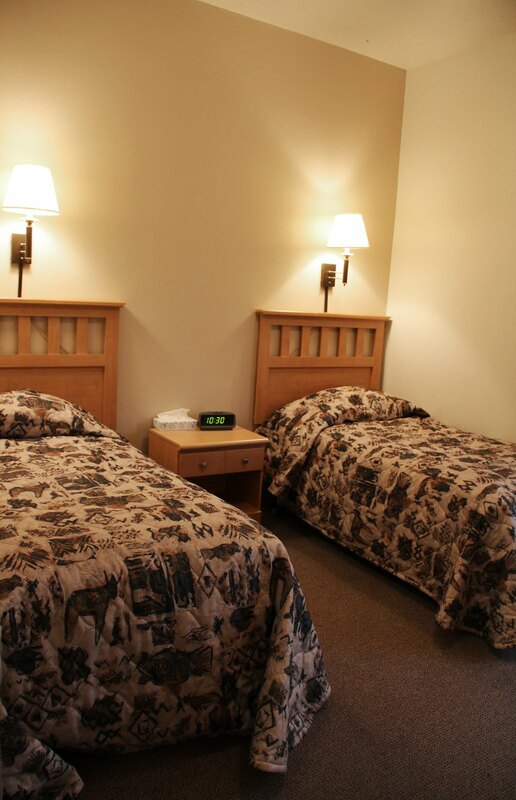 The resort is 45 minutes away from Salt Lake City International Airport. Both lodges are a one-minute ride from Snow Lodge, where we skied. We didn't rent a car; free shuttles are on hand to transport guests around the area, as are the free city buses. Otherwise, there are plenty of taxis; we used Ace Transportation and occasionally hopped on the random moose who ambled by. OK, we didn't. But we all couldn't wait to spot our first moose. We stayed in room 6101, on the first floor, a spacious one bedroom with two fireplaces, a kitchen and a whirlpool tub that fits a family of four if you squish in (just in case you're wondering). The lovely lodge manager, Mary Ann, took good care to make sure we had a great stay. The Silver Baron had an included continental breakfast every morning, and the kids loved making waffles (with chocolate syrup). 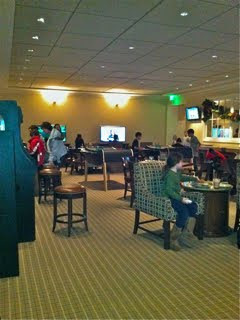 There was also hot chocolate, cider and cookies served every afternoon in the lobby. And, yes, the kids were on a sugar high for most of their time there. Max loved this chair so much he wanted to bring it home, but we explained that we didn't think it would count as a carry-on baggage. We let him watch Cars 2 every single night as we fed him chocolate ice-cream, his idea of heaven. On a wall at The Silver Baron Lodge. "Wow, look at those tennis racquets!" 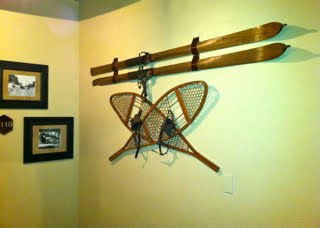 said Sabrina, and I explained they were old snowshoes. "You mean they didn't have Uggs?" she asked. The hot tub in the back of Silver Baron. There was also a nice size heated swimming pool. Because it's dry there, the cold never felt as cold as it does back home in the Northeast. The Deer Valley Children's Center is a state-licensed facility for kids ages two months to 12 years old. 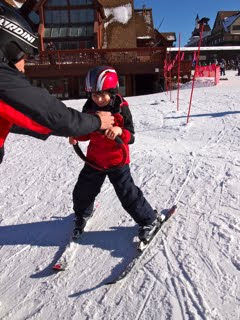 Max referred to it as "ski school" and couldn't wait to be there. I'd let them know about his needs ahead of time, and they couldn't have been more accomodating. The staff was amazingly warm, attentive and just plain fun. Max spent several mornings there and had a blast making crafts, riding various bikes around and playing with kids. There was a girl his age there who had special needs, and the two became fast friends. The Lodges at Deer Valley. And, yes, I wish I were there too. There are numerous hotel and condo offerings in the area. We checked out two other great resorts: the Montage Deer Valley and Stein Eriksen Lodge, where I had a Scott Wolf sighting. That's a good thing because if it were George Clooney, I might have embarrassed myself. At the Stein Eriksen, named after the 1952 Olympic Giant Slalom gold medalist. The hotel ranks among the top mountain resorts in the world, and is Utah's only Forbes five-star hotel. 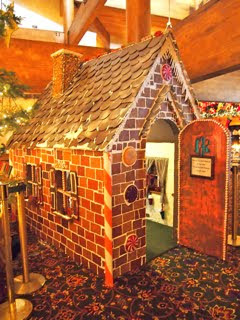 The yummy-smelling gingerbread house at Stein Eriksen was larger than some apartments I've seen in New York City. 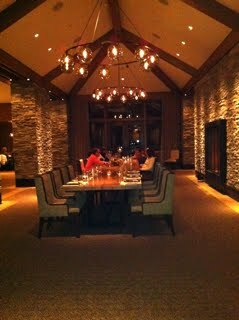 The Montage Deer Valley, just a year old, is an acclaimed hot spot. It recently scored Best Family Program by Virtuoso, clearly evident in the children's program, the in-house bowling alley, the stuffed animals little guests get at check in (mini moose, anyone? ), and Jonas and Monty, the resident Bernese Mountain Dogs who hold court in the lobby for kids to pet. 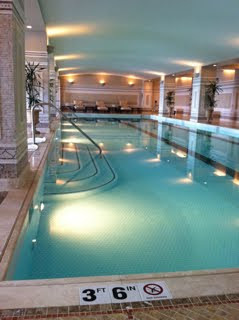 Indoor pool at the Montage; there's a large outdoor heated one, too. The spa is the largest one in Utah. 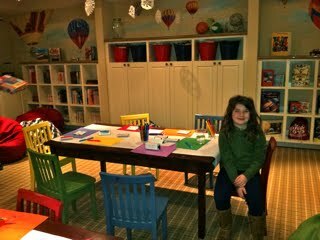 Sabrina at the Paintbox children's club. There's a different theme every day, with indoor and outdoor play. 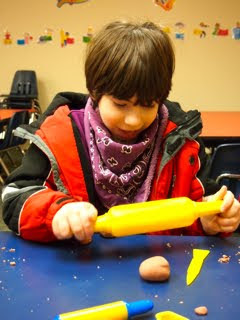 The kids got to enjoy Weird Science Wednesday, which included making snow volcanos out of Mentos and Coke. Sabrina hopes to recreate the effect in our bathtub. Park City, Utah is home to the National Ability Center, a unique non-profit that offers numerous outdoor activities and sports programs to people with disabilities year round. 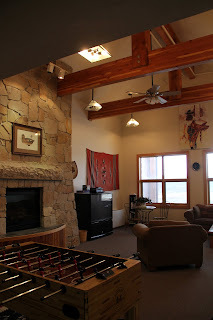 The Lodge on the property has 26 fully accessible rooms, each with a private bath, and you're welcome to stay there is someone in your family is participating in NAC activities. Rooms are booked on a first come, first served basis. At $70 a night during winter months, they're a sweet deal. Sabrina and I both took lessons at Snow Park Lodge at Deer Valley Resort, ranked the #1 ski resort in North America by SKI magazine for five years in a row. 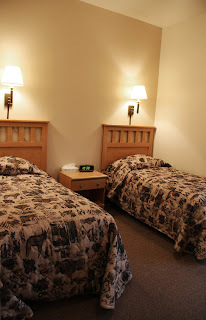 Bonus: You can book lift tickets, ski rentals, child care and ski lessons in one call to Skier Services (888-754-8477). 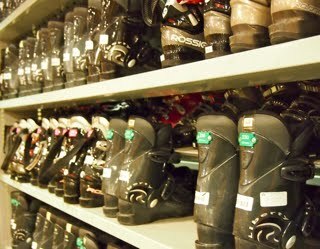 We got our ski rentals there, and staffers in the shop were exceptionally friendly. The boot guy listened patiently as I told him about partially tearing my left ACL two years ago, then looked me in the eye and said "Time to get back in the saddle!" And off I went, skiing. Miraculously, my knee didn't give me any trouble. Although so far the snow has been unusually light this year, it's still far fluffier than any kind I've fallen in before. Snowboarders aren't allowed at Deer Valley Resort (not that there's anything wrong with snowboarders) and they also limit the number of tickets sold, so it's never too crowded. There are 100 trails (that's 60 miles' worth), 27 percent of which are beginner ones. I followed in Sabrina's tracks and stayed on Success and Ontario, and also watched in awe as she flew down the mountain, pole-less. Loved the Wide West Race Course for little kids and weenie adults like me; check it out on this Deer Valley Blog post written by my friend Bari Nan. Sabrina quickly progressed to Advanced Beginner, and I moved up to Intermediate Non-Klutz, the best I can say for me. I learned better control thanks to two lessons with the most amazing ski instructor, Peter Badewitz, a seasoned pro who cofounded The National Ability Center 26 years ago. I found out only after our lessons that he is is a former US Disabled Ski Team Member (a war vet, he has an amputated leg). "Everyone has a disability when they ski," he told me, which is so true, or at least made me feel less ridiculous for being so uncoordinated. Three control techniques we focused on: 1) finishing the turn 2) flexion and extension (dropping down as you turn, then straightening up) and 3) skidding. I still freak out a bit when my skis are pointed downhill on a slope, but I've gotten far better at stopping, which is kind of key. I think my hopes for becoming an Olympic champ depend on whether or not they institute a Speed Typing event. Max was pretty bold, too. Here he is making like Bode Miller at Park City Mountain Resort, where the National Ability Center's adaptive ski program is based. 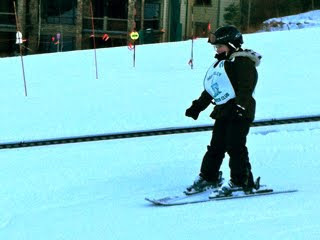 Max had his first lesson there, then two more at Deer Valley Resort. And, holy wow, did he love it. More about Max's skiing and the NAC tomorrow. 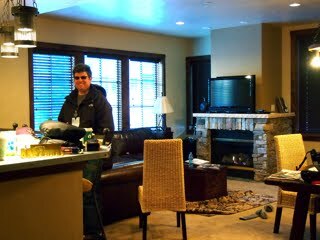 One day Dave hit the Deer Valley slopes from the Montage ski shop; it's ski-in, ski-out, with three lifts outside the door. He thought the equipment was top-notch, and loved the ski valets who help skiers get on equipment (a super-helpful thing for families)—and the warmed boots. 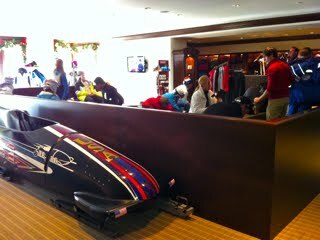 That's the 2002 U.S. Olympic team bobsled in the photo. 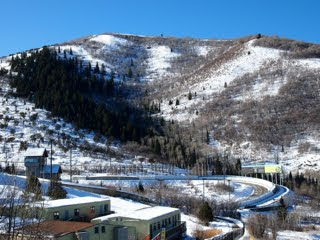 Salt Lake City was host to the 2002 Winter Olympics, but several ski events were held at this site in Park City. Today, it's a year-round training, competition and recreation venue. 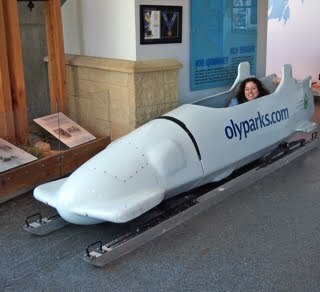 You can get on a bobsled ride with a professional driver, or try intro camps in ski jumping, luge, and snowboarding. The 2002 Olympic bobsled and luge track. There's a staff of 10 people spritzing it with water, shaving the ice and generally keeping it up. Hanging in the museum. I sort of look like I was born in a luge, right? I learned lots of interesting stuff there, including the reason for the area's super-fluffy snow: the lake effect. When clouds coming from the Sierra Nevada Mountains hit Utah's Wasatch Range, they pick up warmer vapor, which freezes up and comes down as super-fluffy power. I also learned about how the area sets off avalanches as a control (I have a morbid fascination with avalanches). 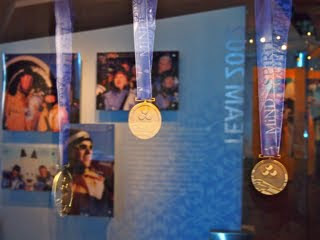 I particularly loved seeing these medals from the 2002 Winter Paralympics. This is what it looks like to stand at the top of a 64 meter ski jump. One word: eeep. 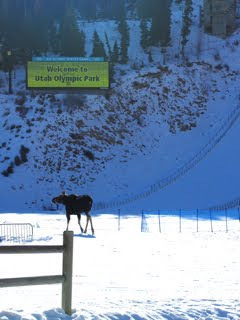 And this is what it looks like when a moose decides to amble across your path as you are exploring Olympic Park. 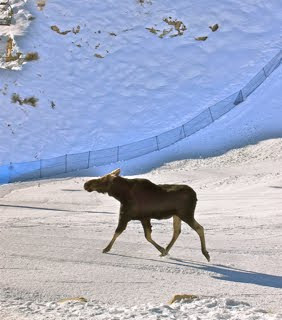 The moose tried to climb its way up the 64 meter jump, but didn't succeed. Still, he looked like he'd be a better skier than me. Located several miles away from Park City's center, this activity park is full of downhill thrills. 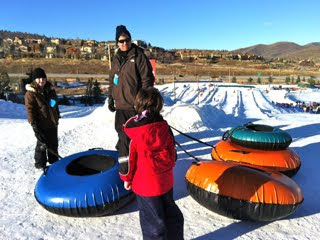 There are seven tubing lanes and three lifts, plus a Fort Frosty area with a mini conveyor and a tubing carousel. "No skill needed," the website proclaims. Amen! Max was dubious about tubing. In fact, he wailed the entire way down. Not his thang. The rest of us had a blast. 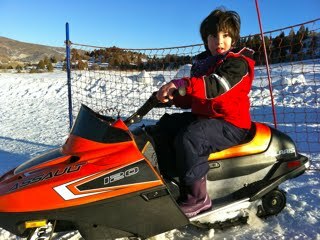 Max was more into the mini snowmobiles for kids ages 5 to 12. The controls were a little hard for him to handle but he really liked sitting on one and watching kids whiz by. 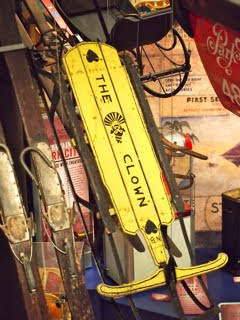 Centrally located on Main Street, the museum is full of Park City history and interactive stations. 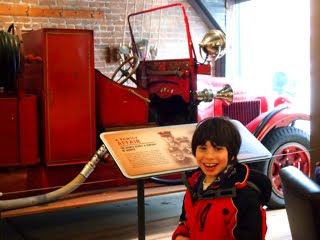 Max was into the old fire truck, even though it had nothing to do with Lightning McQueen. 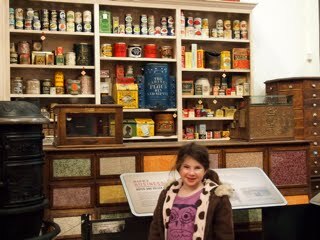 Sabrina in a recreated Smith & Brim Grocery. Little visitors to the museum can also "connect" calls at the switchboard, detonate "dynamite," check out the two-story replica of the 19th century Mega Mine mill (Park City was once a major silver mining center) and climb into the world's only Skier Subway, a mining tram transformed into an underground ski lift in the sixties. But water dripped all over the place, and riders froze up the second they hit air. Fail! Once you're done with the museum, you can amble up and down historic Main Street and explore shops, galleries and restaurants. Unless you're Max, in which case you only want to sit in Main Street Pizza and Noodle and eat pasta. Many of the buildings date back to The Great Fire of 1898, which destroyed more than 200 homes and businesses. It would probably be easier to list where not to eat, because every restaurant we visited was outstanding. 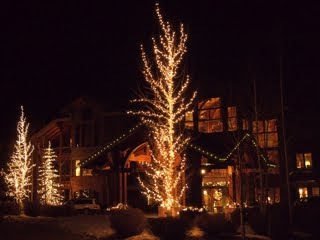 Mostly, we dined at Deer Valley Resort because if was convenient and had some of the best eateries in the area. A dining experience unlike anything I've ever tried, the restaurant has expansive rooms and five stone fireplaces, with cooks preparing different foods—a la European Alps dining. It's a beautiful setting, dimly lit with flickering fireplaces and heavenly smells. Before or after, you can take a horse-drawn sleigh ride or a snowshoe trek. Sabrina and I did a twilight sleigh ride, cuddled beneath blankets. 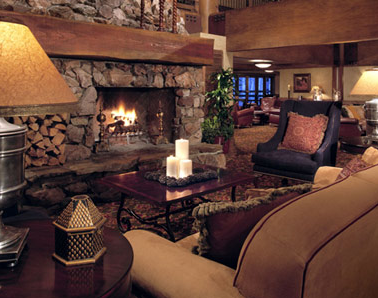 With Fireside Dining, you fireplace-hop to get your fill. I melted over the warm Swiss raclette cheese, dished onto a plate and downed with small, round slices of homemade bread. A table with accompaniments included delicious homemade mustards, marinated baby pearl onions and cornichons. 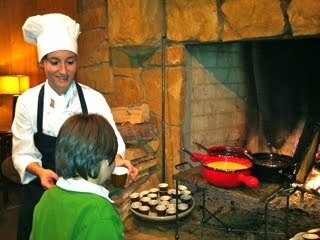 Stations featured various stews, potato rosti, roasted leg of lamb, prime rib and several vegetarian offerings. Max checks out the dessert fondue—chocolate, caramel and white chocolate Grand Marnier. A lavish spread of dippers included fruit (fresh and dried), cookies and cake. There's also a super-rich Bavarian chocolate pudding cake...if you have room. We got a babysitter for our dinner at this elegant restaurant with absolutely exquisite food, which some consider the best in the area. To get there you take a funicular—a tram that rides up a major hill, which makes the evening even more memorable. The restaurant has a select offering of favorites from acclaimed chef Jean-Georges, made with local produce, meat and fish. 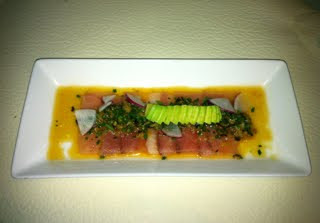 We had the Sliced Hamachi appetizer, a farmed version of yellowtail in a soy-ginger dressing. Dave got the Black Pepper Octopus and Paisely Farm Pork Belly with apple cider and shallot confit and the man was licking his chops. Plus we sampled the black truffle pizza (OMG!). I got to chatting with the manager there, Scott, who insisted I try the Soy Miso Mustard sauce you can choose for your steak or seafood. Twist my arm! Tangy, with lemon and lime juice and soy sauce, you could eat this stuff on cardboard, I'm telling you. And now, I've got the recipe. For the main course, Dave went with the 14 oz. 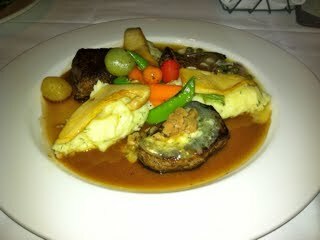 Snake River Wagyu Strip steak and I had the Slow Cooked Scottish Salmon with truffle dressing and mashed potatoes. And I am so sorry if I'm making you extremely hungry. I happen to have two stomachs: My regular stomach, and my dessert stomach, and so I always have room for sweets. Our server recommended the Salted Caramel Sundae. 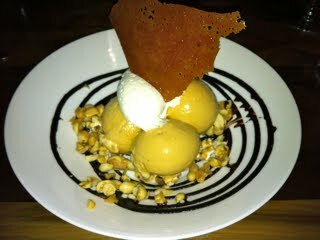 I was a little dubious—a sundae at a fancy restaurant?—but it was scrumptious, caramel ice-cream served over roasted peanuts and candied popcorn. I wanted to take one home! 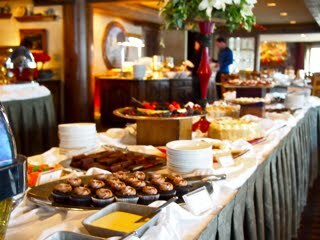 After you work up an appetite skiing, this elaborate lunch buffet at the Giltretind is a wonderful place to lunch. Stein Eriksen, the director of skiing at Deer Valley Resort, regularly has lunch in the bar area. Among the offerings at the first spread: soups, chili, several kinds of salads, seafood (including crab legs and shrimp), and a major cheese selection. Then there's the hot food spread, which can include everything from duck breast to Mahi Mahi to Yukon Gold mashed potatoes, plus prime rib at a carving station. 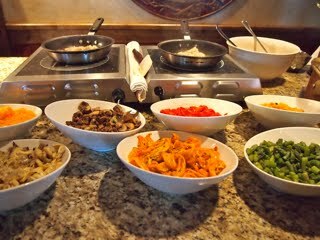 I was a sucker for the risotto station, where you could have yours made to order with veggies, chicken and other ingredients. 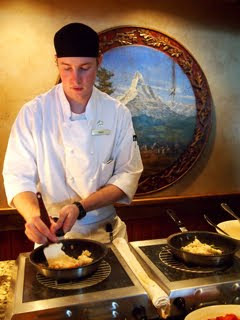 David here is a chef doing his internship for the Culinary Institute of America, and he makes a mean mushroom-red-pepper risotto. 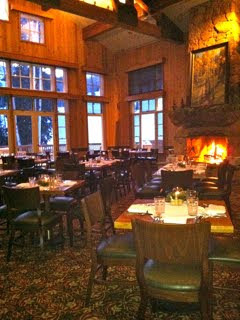 Located at Silver Lake Lodge, this restaurant ranks #1 for food in Zagat's Park City, Utah, listings. The menu is New American, and the setting cozy ski chalet. You can do a tastings menu—there's a regular one and a vegetarian option—or order a la carte. Portions are large; come hungry! We started with the Ahi Sashimi with rice crackers, the delectable Warm Vidalia Onion and Gruyere tart. and Fried Green Tomatoes with melted chèvre and crispy shallots. Bari Nan had recommended the Burrata, Fresh Basil and Heirloom Cherry Tomato Salad. It's a ball of cheese goodness that's smooth on the outside and creamy-stringy inside. A mixed plate for the main course: Niman Ranch Prime Beef Tenderloin Filet, Bear Lake Lamb Loin and Veal Tenderloin Medallion. Dave went for Seared Natural Bison Filets topped with foie gras. Neither of us could stop saying "mmmm." 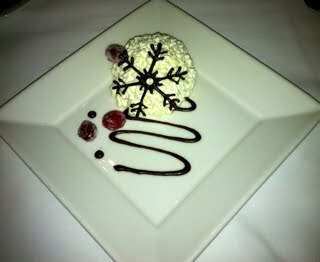 The restaurant's signature dessert: The snowball, a decadent dark chocolate confection topped with creme fraiche. A place for a low-key meal with surprisingly gourmet cuisine, in Deer Valley Plaza. It offers soups, stews, salads, paninis, homemade breads and take-out entrees. 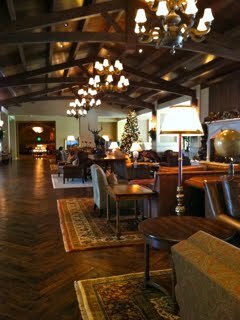 Dave loved the resort's signature turkey chili, I had an amazing Asian salad with house-smoked salmon and sesame ginger vinaigrette, and we both enjoyed the Charcuterie Plate with a mix of cheeses, salami and pickled treats. 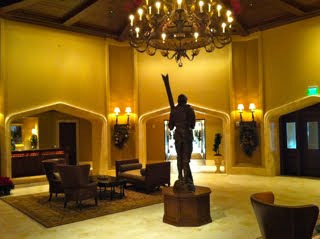 Located at the Montage, this is a casual spot all four of us enjoyed. Max can't stand crowds, so we went at 4:00 one day and practically had the place to ourselves. 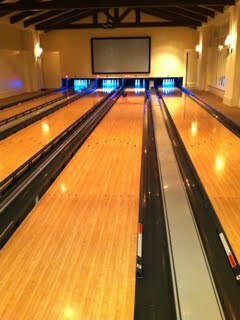 First, we hit Daly's Pub & Rec bowling alley. 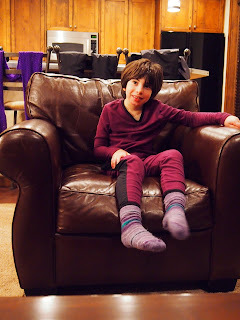 Max went gaga for a purple bowling bowl; he insisted on keeping it on our table as a centerpiece during dinner. The pub has brick-oven pizza, sandwiches, salads, posh pub fare like Montage Mountain Ale Battered Fish and Chips and kid favorites like Cheddar Mac 'n Cheese. Dave and I had a relaxed meal as the kids played on the Wii and downed their meals. The pub also has billiards, darts, shuffleboard and a row of seven old-fashioned video games including Pac-Man and Donkey Kong. We left Park City extremely well fed and happy. As is the custom, Max cried when the plane landed. Luckily, he did not ask to take a moose home. Disclosure: I received some meals and services gratis, but the opinions expressed here are my own. So are the calories, alas. What an amazing trip, I had never thought of Utah as such a great travel destination. Actually, I will have to come back to finish this, but thanks, Ellen. 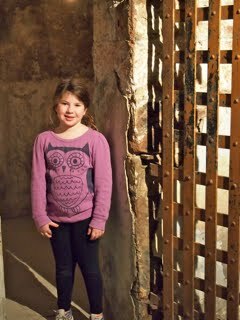 Your vacation reviews are so enjoyable and give families a view into what can be. "the fluffiest snow I've ever fallen into" hehe! That would be me, too - if I ever get to ski again. The desserts got to me! I sometimes indulge in a hot fudge sundae for breakfast when on vacation. Thanks for a great vicarious vacation. Wow! Thanks for this awesome review! Can't wait to read more about Max skiing and the NAC. 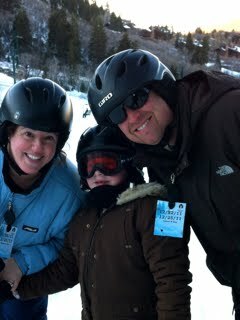 Skiing is something we've been wanting to do with our son, Ben. 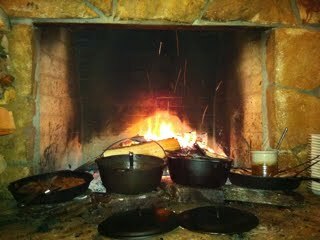 BTW, I've been wanting to do the Fireside dining for a while now. You've inspired me. I'm making a reservation this week! Happy New Year! Loved hearing about your vacation, especially the food ;) I think we know someone in common, Bari Nan...she and I went to college together and was who I thought of immediately when I saw Park City in your title. :) Happy New Year! Yay! I have been waiting for this post especially, and you did not disappoint. 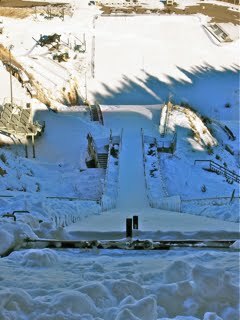 I was in Park City just before the Olympics in 2002. I loved it, but I never looked at considering special needs. I am so surprised to hear about all the accommodations, and I look forward to tomorrow's post. I am so very happy that you all had a wonderful time, and I am loving those desserts. That salted carmel confection has me drooling. I almost teared up at the mere mention that Max skiied and enjoyed it! Sounds like an amazing time. Great photos too. 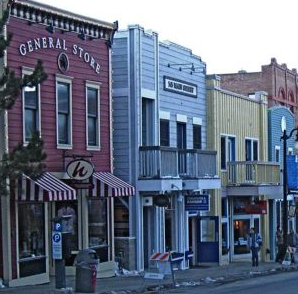 Park City really is an amazing place to visit, and I've heard it's just as wonderful during summer. ELR: Guess what? I was at same college, though I'm older than Bari Nan, which makes me 32. He, he. Nice to connect! She showed me a wonderful time there. We live in Utah!! I had no idea you were here. I would have LOVED to met you and Max. But I want to take Ty skiing now. How fun is that. We have some amazing ability stuff in the valley. I hope you were able to enjoy temple square one day to see the lights. Dang .. I really wish we were there!! What a shame Max didn't go for the tubing--maybe if there had been a purple tube? What an amazing vacation--everything looks so luxurious! MAYBE if there had been a Cars 2 Tube. But I am not convinced. And, yes, you could say we splurged. As in, blew our entire vacation budget for 2011. And probably 2012. Worth it!!! 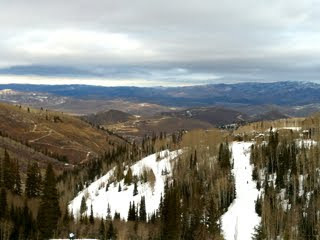 As a local Park City resident I can tell you that you never get bored of the mountains; especially this time of year! Its a small world- I grew up in SLC, Utah yet I live in Salem, Oregon now. I think your vacation posts give parents who have children with extra needs hope and confidence for the future as well. That, is a good thing. Anon- what is Park City Laundry Care? What an amazing trip, I had never thought of Utah as such a great travel destination. The fondue looks amazing, I just finished my cheese fondue recipe and it turned out delicious!